Eagle Lake; Warren County; Mississippi; USA;. “1” represents an automated point radius output from Biogeomancer. 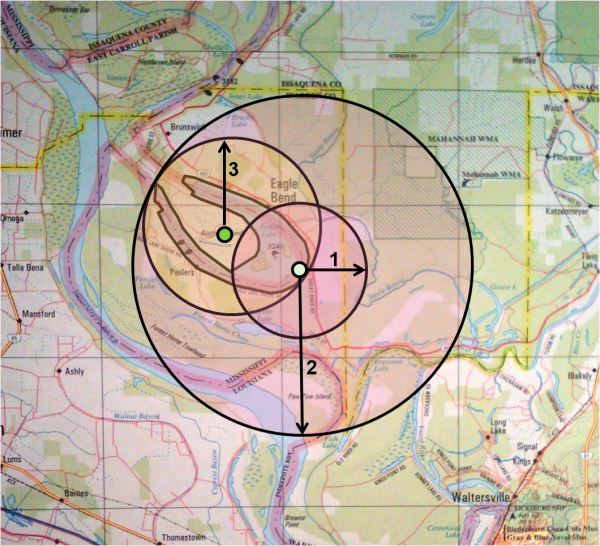 “2” represents an adjusted point radius to encompass the entire locality. “3” represents an adjusted locality and radius to best fit the radius to the locality. In all cases additional water bodies and habitat types are included or invalid placement of the locality occurs. Only the center polygon outlining the lake is suitable for this locality.